Adande has launched its new A+ Fridge which will be available in both side and rear engine model configurations. The A+ Fridge is solely designed for refrigeration (0°C to +15°C) with an EU Label for A+ rated efficiency (correlated to the class, annual energy consumption in kWh, net volume, temperature and humidity) associated with EU stringent testing standard (prEN16825:2015). 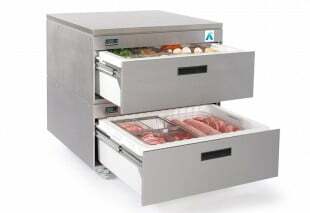 The new drawer unit uses Adande’s ‘Hold the Cold’ technology as well as hydrocarbon refrigerant – said to offer good temperature stability. Adande believes that the new model’s ergonomic efficiency combined with an easy to clean regime makes it attractive to both kitchen staff and the operator. Karl Hodgson, UK sales director, remarked: “Customers are often surprised when we tell them that an Adande drawer is typically fridge and freezer combined, but there are still customers who would prefer a ‘refrigeration only’ option. The drawer looks the same as the manufacturer’s modular range; however, its badge has been designed to highlight its A+ credentials. When compared to Adande’s standard VCS/VCR R600A in chiller mode, the A+ Fridge is said to have an energy saving of 23%. Hodgson added: “2016 will see the A+ Fridge being showcased by our knowledgeable sales team at a range of trade shows around the UK and Europe.